Bing Crosby (Harry Lillis Crosby) was born May 3, 1903, in a house that his father built at 1112 North J Street, Tacoma. Bing's family moved to Spokane in 1906. 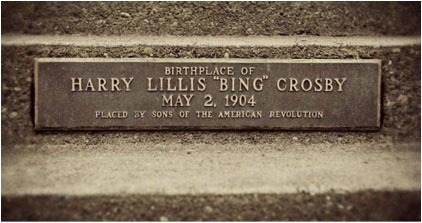 Bing, or Harry Lillis Crosby Jr., was the fourth of seven children born to brewery bookkeeper Harry Lillis Crosby Sr. and his wife, Catherine, in 1904. The family lived in a home their father built at 1112 North J. Street in Tacoma, Washington. However, the family moved from Tacoma to Spokane in 1906, which is where Harry Jr. was primarily raised.